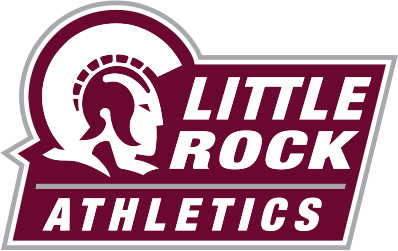 The 2017-18 athletic year is well underway in Little Rock (LR), with five sports; track and field/cross-country, volleyball, soccer, golf, and swimming all competing and making headlines for the University frequently. The Trojan Tracker rounds up all the latest news, results, and upcoming events for each sport. As of writing, LR TF/XC have competed in two events, the Brooks Memphis Twilight Classic and the UCA XC Challenge. At the Twilight Classic, the women’s cross-country team finished 12th with freshman Vianney Sanchez taking a 52nd-place finish in her first college race, the 5K. Fellow freshman Hannah Mannine finished 74th, while sophomore Hunter Paul finished moments behind, in 76th. The men’s cross-country team finished in eighth, with senior Isaac Lalang headlining the Trojans in 13th-place. Junior Rogelio Araiza finished 41st, while sophomore Emilio Medina finished 43rd. At the XC Challenge, men’s runner Lalang followed up his impressive start at the Twilight Classic to win the XC Challenge. Araiza and Medina finished eighth and ninth as the Trojans performance helped the team to finish second. The women’s team also ran well, finishing fifth at the Challenge. Mannine, the Trojans highest finisher, placed eighth, while Sanchez placed 11th. Paul followed at 16th. Looking ahead, LR TF/XC compete in the Chile Pepper Festival in Fayetteville this weekend. The Trojans will host the Little Rock Invitational at Rebsamen Golf Course on Oct. 14. LR volleyball is off to a slow start this year with a record of 4-10. The season started at the Southern Miss Invitational. LR lost two out of three matches, defeating Jackson State before losing to Miami and Southern Miss. The Trojans faced a similar outcome at the UCA Invitational, with a victory over UT Martin before losing to UCA and Memphis. LR finished similarly at their final two invitationals of the year, the Holiday Inn Express SFA Invitational and the Billiken Invitational, having lost to Colgate, Stephen F. Austin, Saint Louis, and DePaul, while beating Texas Southern and Louisiana Tech. LR dropped their first two home games of the season, but showed promise versus Appalachian State on Beach Volleyball Night, Sept. 22, narrowly losing 3-2. Despite their start, LR still has half the season to turn it around, with seven home matches coming over the next six weeks, as well as two away matches in Louisiana this weekend. LR soccer has started the season 5-5-1, remaining unbeaten at home. In contrast, the Trojans have yet to win on the road. The season started with an overtime win versus UCA at the Coleman Sports and Recreation Complex. The Trojans dropped their next two away contests versus Memphis and Texas (televised on the Longhorn Network). LR rebounded with consecutive home victories, shutting out Missouri State and Sam Houston State. Similarly, the team lost two straight away games and came home to take a win and a draw versus UAPB and Louisiana, respectively. Despite losing a close 1-0 match in Jonesboro last Friday, LR beat Rio Grande-Valley 4-0 in front of a home crowd Sunday. Tomorrow night, the Trojans kickoff a two-game weekend homestand versus ULM and Coastal Carolina, with kickoff times of 7:00 p.m. and Sunday at 12:00 p.m.
LR golf has competed in five total tournaments the past month, three for the women’s team and two for the men’s. For the women, they’ve competed in the Hobble Creek Classic, Marilynn Smith Sunflower Invitational, and the Pirate Collegiate Classic, finishing seventh in the first two, and 14th in the Collegiate Classic. The highest finish by a Trojans women’s golfer in the tournaments came in the Sunflower Invitational where senior Sabrina Bonanno tied for fifth. The men’s team competed at the Memphis Intercollegiate and the Mark Simpson Colorado Invitational, finishing third and eighth, respectively. The men’s top finisher at the tournaments was junior George Scanlon, who tied for seventh at the Intercollegiate. Coming up, LR men’s golf will compete in the Bayou City Tournament on Oct. 9, while women’s golf is scheduled to compete in the Johnie Imes Classic Oct. 2. The LR swimming and diving team has yet to start their season, with their first meet coming tomorrow at the North Texas Relays. That being said, the team has been making headlines outside of the pool. LR swimming and diving signed 9-year-old Edyn Grace Walterhouse as an official member of the team on Sept. 20. Edyn, diagnosed with CAPOS syndrome, was signed to the team with the help of Team IMPACT. For more on Edyn and Team IMPACT, read our story here. For more news on Little Rock Athletics and all the happenings on campus, keep following the Forum.